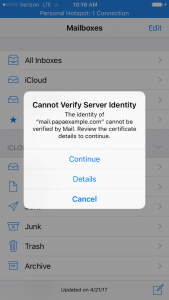 If you see an error message in your Apple iPhone or iPad iOS Mail Application, that states cannot verify server identity, this article will guide you on how to fix it. Method 1: Preferred so that you do not face any inconvenience in the future. Click “Trust” in the upper right hand corner of your screen. Your connection is still secure, the SSL Certificate is simply expecting the server hostname rather than your mail.yourdomain.tld. We are testing methods of avoiding this notice being given entirely, but we do not presently have an ETA. 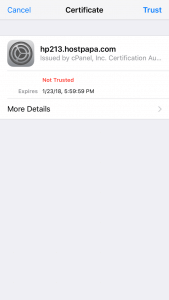 Method 2/Alternative: Use this method if you are unable to select “Connect, Accept, or Continue” to bypass the notice message. 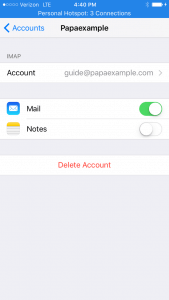 Select the account once more up top and then you should see the various settings you have for the account and in specific we will need to edit both the incoming and outgoing mail servers on this page. To begin making the edits select the “Host Name” field under “Incoming Mail Server” and erase mail.yourdomain.tld / yourdomain.tld and place the server hostname into this field. If you do not know your server hostname, our support team can provide that to you. 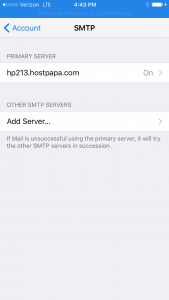 Once done editing the incoming mail server, lets click the Outgoing Mail Server and you’ll be taken to a page with your outgoing mail servers listed, we will need to edit the outgoing mail server associated with your cPanel email accounts. Choose the “Host Name” field and erase mail.yourdomain.tld / yourdomain.tld and replace it with the server hostname as provided in your welcome email. If you notice any problems or if you need any help, please open a support ticket from your HostPapa Dashboard. 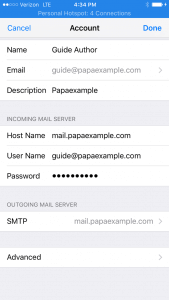 More details on how to open a support ticket can be found here.